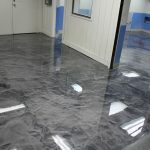 If you are like many of our clients who are looking for an unusual and distinctive custom flooring option for your home or commercial building, it is hard to beat the beauty of an acid washed concrete finish. Suitable for some indoor and outdoor residential, restaurant flooring, and commercial flooring applications, our acid washed stained concrete service is popular several reasons – it is a cost effective, low maintenance, attractive floor finish, and is available in unlimited colors and design styles. What is Acid Washed Concrete? Acid washed flooring is created by applying a solution of acid, water and inorganic chemicals to a cured concrete surface. Variations in the concrete’s porosity, density, and water retention creates the unique marbling effect and extraordinary hues in the finished concrete. What are the Benefits of Acid Washed Concrete? 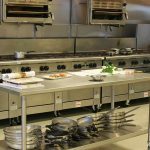 1.Our Acid Wash Process adds Versatility: An acid wash finish can be applied to virtually any concrete surface, from flooring to countertops, including surfaces that have been in place for years. Due to the chemical makeup and content and variations in the surface texture, as well as ambient environmental conditions, each acid wash application is unique. The surface can be etched in virtually any pattern, such as stone, brick, tiles, custom patterns and even monograms. Applying a stencil during the installation process results in beautiful, complex patterns. Stencils can even be used to emboss patterns into the acid washed concrete. Alternately, applying an overlay after acid washing, but before concrete staining creates rich depth and a stunning effect. 3. Our Dreamcoat Flooring acid washed finishes are durable, and resist damage such as chipping, cracking, staining or discoloration from materials being dropped or spilled. Once sealed, the finish is sturdy and forgiving for both living spaces and high foot-traffic areas. 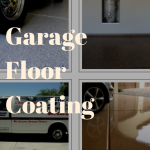 If you are thinking about installing or beautifying your existing concrete surfaces, weighing your design options, or are considering the benefits acid washed concrete flooring vs epoxy coatings, please contact our professional concrete coating contractor company in Phoenix, AZ Metro today! We can be reached at 480-226-4172 for a free design consultation and floor estimate to help you determine if an acid washed application is right for your home.